What tools (ideally affordable ones) would folks recommend for creating a website wireframe? What tools have you used, and did you find them better than pen and paper? Firefox Pencil Plugin is another tool to check out. Its free, has a nice basic set of stencils, and some sketchy stencils. You can get some rough mockups done pretty quickly. Not as many stencils as other tools, but it works pretty well. I haven't tried other stuff yet! I use Justinmind, great to wireframe and prototype dynamic websites (JS-like events & integrate your own data) without coding (even interactions are drag & dropped). They also offer a service to share your wireframes online so that people can comment straight on elements & you can even carry out user tests as it integrates most user testing tools (clicktale, userzoom, google analytics...). Macros that make working with Visio much easier. In particular, copying pages and copy/paste items "in place". 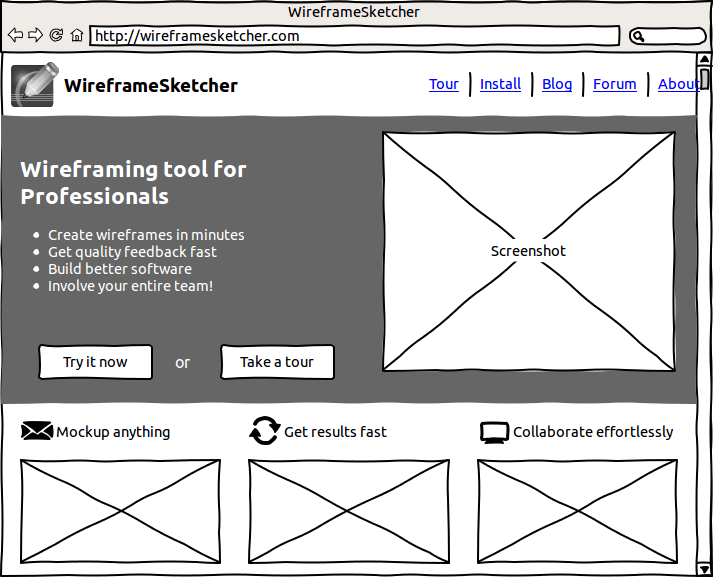 WireframeSketcher is a software tool that helps quickly create wireframes, mockups and prototypes for desktop, web and mobile applications. It comes both as a plug-in for any Eclipse-based IDEs and a standalone version. I'm getting pretty tired of the people saying they are only using pen and paper. The whole point with a tool for sketching must be to make a pattern library and use it so you can focus on the bits of the project thats interesting and innovative instead of the boring parts you have done so many times before. Comon! Of course you use pen and paper sometimes, but seriously, when people ask for advice about tools - don't mock them suggesting pen and paper - don't you think they know about pen and paper before they asked the question? I use Axure. It's not pretty but it gets the job done. I use ForeUI that is a great tool for creating prototypes, in which you can add behaviour to simulate rather complex system behaviour. - If that's required for your prototype. The DHTML prototype can be exported and run in any browser, that support java, and easily be shared with colleagues and customers. I'm designing software for Windows, but ForeUI can be used for anything - including web. It runs on Windows, Mac, Linux, and Solaris and the price i $99. Usually a new version is released every fortnight. Find more details on www.foreui.com. I use it when I need something draft, fast, online! What software do you use for drawing diagrams? Is it uncommon in the industry to use Inkscape to create wireframes? If yes why? What is better for wireframing: Photoshop or Illustrator? Why? What high fidelity tools are best for detailed prototypes? What do you do after paper prototyping? What could be alternatives for Use cases? Do you think any UX tools to replace them efficiently? What UX designers tools do you use? What open source and free wireframing tools are there?